Enroxil® 10% injection for active ingredient in 1 ml contains enrofloxacin – 100 mg, and as auxiliary substances – butanol 30 mg, potassium hydroxide 16 mg and water for injection up to 1 ml. Enroxil® 10% solution for injection is used for cattle, sheep and goats subcutaneously, and for pigs, pigs and sows intramuscularly once a day for three to five days, at a dose of 0.25 ml per 10 kg of animal weight (2.5 Mg of enrofloxacin per kg of animal weight). In case of salmonellosis and respiratory infections, Enroxil® 10% solution for injections is prescribed once a day at a dose of 0.5 ml per 10 kg of animal weight (5.0 mg of enrofloxacin per 1 kg of animal weight) for five days. In view of the possible pain reaction of Enroxil®, a 10% solution for injection should be administered in an amount of not more than 5 ml in one place to large animals and not more than 2.5 ml to small animals. 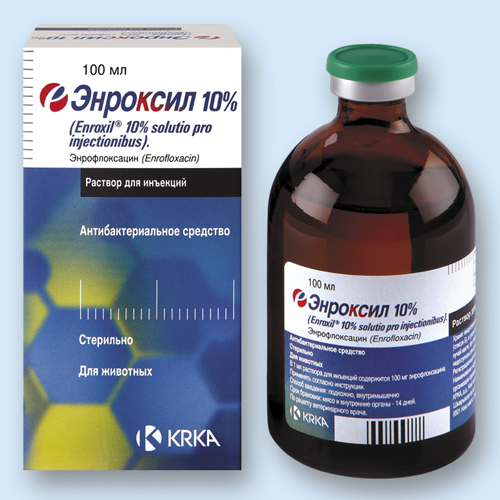 It is forbidden to use Enroxil® 10% solution for injections to newborns, dairy cattle, due to the isolation of enrofloxacin with milk, animals with severe cartilage disorders, with nervous system disorders accompanied by convulsions; Females during pregnancy, with severe liver and kidney damage, and also when microorganisms resistant to fluoroquinolones are isolated from a sick animal. Do not simultaneously use Enroxil® 10% solution for injection with chloramphenicol, macrolides, tetracyclines, theophylline and non-steroidal anti-inflammatory drugs. Slaughter of animals for meat is allowed no earlier than 14 days after the last use of the medicinal product. Meat of animals, who were forced to die before the expiration of this period, can be used for feeding fur-bearing animals. Enroxil® is produced. A 10% solution for injection is issued in packs of 50 and 100 ml in bottles of dark glass. 5 years from the date of production.